Two to three 100-car crude oil unit trains a day now arrive in the Pacific Northwest. My impression is that business is slowing a bit in our machining world, though IMTS exhibitors moved a lot of iron. Auction prices have trended softer for the last several months. The recent Belden sale brought prices considerably lower than I had expected during the summer when the company was taking bids from auctioneers. The recent mini collapse of oil prices has sent gasoline prices under $3.00 per gallon in low tax states like New Jersey. While this is something to be thankful for ahead of Thanksgiving, the oil patch is suffering from heartburn, adjusting to $80 crude. Break even for fracking in some places is in the $60 range, so the marginal producers are starting to fret and the makers of the drilling gear are already feeling their angst. Oil pricing may be part of a non shooting war with the U.S. and Saudi Arabia against Russia and Iran. Vladimir Putin and the Russian economy are beholden to oil pricing to keep the economy afloat. The U.S. Iran nuclear negotiations are at the crucial stage now. Obama does not like soldiers shooting, but drones and oil are weapons he may be willing to use. The hacking epidemic of credit cards emanating from the Kremlin is likely another front in the engagement with the Russians. The Keystone Pipeline may be permanently derailed in Obama administration infighting, but the Alberta oil will find a market. Now the big talk is that a trans-Canada pipeline will be built to Canada’s East coast starting in 2016. 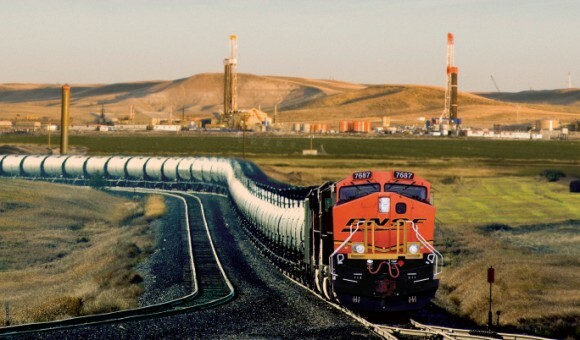 All those pipeline building jobs will stay up North, but Warren Buffet’s trains will keep inefficiently schlepping oil to the American West Coast. The average “Announced crowd” at Cubs games in 2014 was close 33,000, but the real number of people who may have actually attended a day game in a lousy season like this one might be around 20,000. The announced attendance at IMTS last month was 114,000, but the registration of attendees who were not working the show was 59,000. Grainger Corporation has provided 800 $2000 scholarships in the last six years for skills training in machining and other important trades. Grainger is a multi-billion dollar corporation, but they should be lauded for their contribution to the field. I recently talked to Erik Anderson, who has two machining firms in central Wisconsin. He is doing in-house training and working with local schools to bring skills into the company. If the Feds and the States can’t move the ball, at least for-profit firms are contributing to the public good while looking after their own bottom lines. A shout out to Tony Bennett, the wonderful singer. He just came out with a new album with Lady Gaga, singing a duet of “Dancing Cheek to Cheek.” I watched him sing “God Bless America” without accompaniment at the San Francisco Giants first playoff game. It was a perfect solo. I was moved to tears, and got up from my seat to sing along with the 88-year-old master. Eric Kester is writing a memoir about being a ball boy for Chicago Bears games. I read a powerful op-ed piece in the New York Times by him, talking about the players arriving at the games so hung over they could barely put on their socks. He describes the incredible physical beating they endure each game. The players certainly are modern gladiators, and we fans love their passion and all-out effort on the field. The bad behavior of the Ray Rices and Adrian Petersons can never be excused, but writing like Kester’s behind the veil view of their suffering, as we cheer, is fascinating and illuminating. It is estimated that 41 million people, almost all guys, play fantasy football. While the offensive lineman may be the most important players on the field, other than the quarterback, they do not make anybody money in Fantasy. It’s a pity. They need a stat. Anybody have an idea how to give them a Fantasy point? We are expanding sales currently. Just lost a sale from the oil patch, but shipped another to a firm in the natural gas arena. Automotive surprisingly quiet. Aircraft and rail are strong. Truck, hard to tell. They say sales are off because there are not enough professional drivers. New CNCs are taking away second hand sales especially in Swiss. Plenty of old Brownies and Acmes out there with few buyers. Our fiscal year began July 1. Our first quarter was the strongest in our company’s 36 year history. Our backlog was very strong., but I don’t expect the same level of shipping in the second quarter.